Yvette Weijergang. 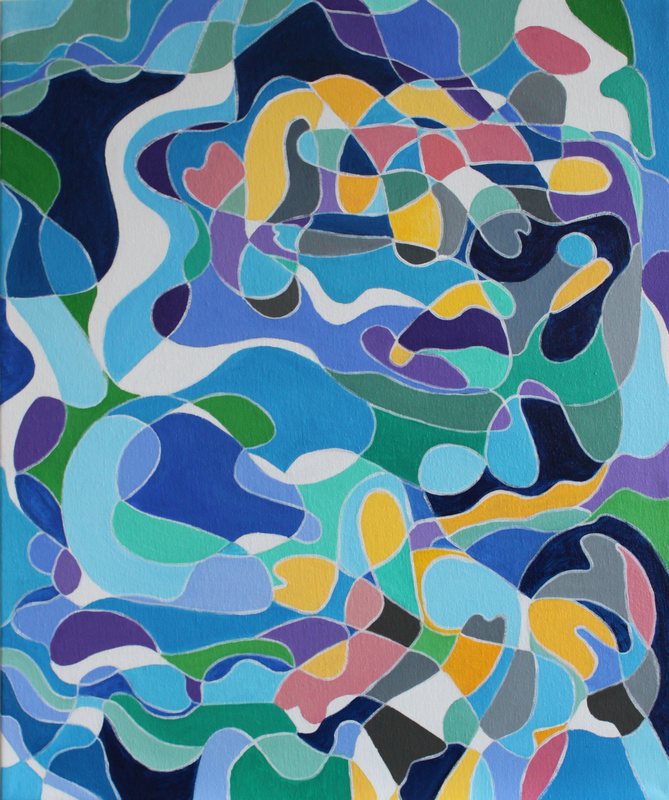 “Fish in a Pond.” Acrylic on canvas. 20 x 24 inches. This exhibition of paintings spans the country and includes a variety of decorative application. As its title suggests, nature has been transformed rather than interrogated, mimicked or passionately expressed. South Carolina artist Sara Schneckloth proclaims that her works are an “ongoing investigation into the relationship between the bodily activity of drawing and our interpretation of natural systems and phenomena.” It is debatable whether this application of academic art talk has produced any unexpected revelations. Her flat, tangled complexities, similar to gnarly old tree bark, would be quite compatible with sleek and shiny corporate décor. Specifically, they produce enough ominous anxiety to belong in an attorney’s office. Elise Morris. “Winding Ways.” Mixed media on panel. 22 x 30 inches. Even more overtly corporate and commercial are the mylar paintings of Jackie Battenfield, author of “The Artist’s Guide: How to Make a Living Doing What You Love.” The entrepreneurial New Yorker’s relentless hard edges and uncomfortable patterns of painted foliage push viewers back, reminding them that they have other, more important business to transact. By contrast, Elise Morris appears far more interested in meditative self-realization. The Bay Area graduate of the John F. Kennedy University’s Consciousness and Transformative Studies program has apparently been introduced to Chinese brush painting, especially from the sensual late Qing Dynasty. 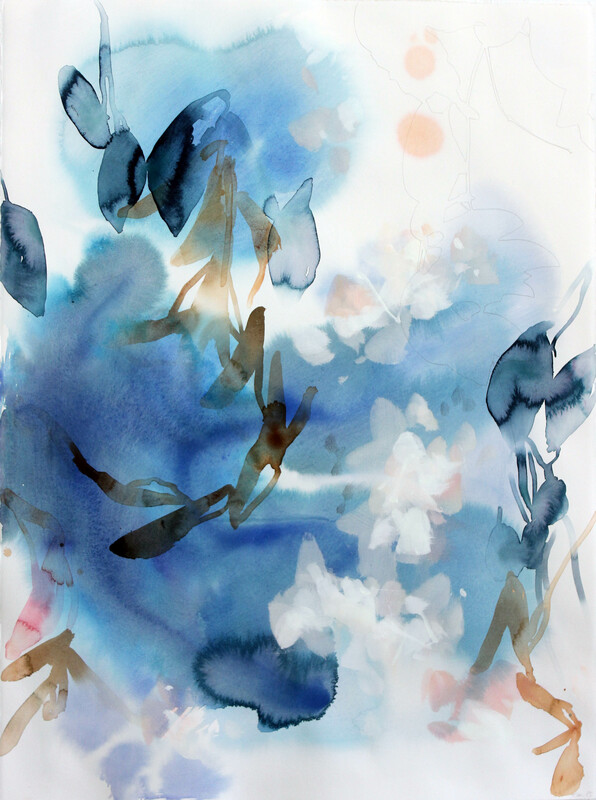 Her pieces offer the same transitory delights of water and light, but with a softer, sweeter focus. Soaking up any ambient stress, they would work well in a physician’s waiting room, but she is just a bit awkward when offering the kind of sharp definition that might make for an enjoyable contrast. On the other hand, knife-sharp definition is exactly what the fourth artist, Chicagoan Yvette Weijergang, is all about. With strong, dynamic lines defining discrete areas of solid color, her designs beg to be room-sized mosaics in a public thoroughfare, like the Tiffany room at the Cultural Center. If her work adorned a CTA station, I might miss the train.